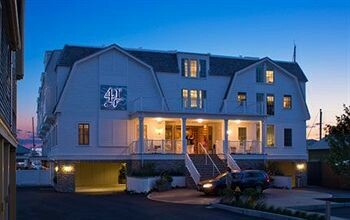 Property Location A stay at Forty 1 North places you in the heart of Newport, walking distance from Whitehorne House and St. Mary&apos;s Catholic Church. This 4.5-star hotel is within close proximity of Bannister&apos;s Wharf and Museum of Yachting.Rooms Treat yourself to a stay in one of the 28 individually decorated guestrooms, featuring fireplaces and flat-screen televisions. Your Tempur-Pedic bed comes with down comforters and Frette Italian sheets. Wired and wireless Internet access is complimentary, while iPod docking stations and digital programming provide entertainment. Conveniences include laptop-compatible safes and desks, as well as phones with free local calls.Rec, Spa, Premium Amenities Treat yourself with body treatments and facials. Additional amenities include complimentary wireless Internet access, wedding services, and a fireplace in the lobby.Dining Grab a bite at one of the hotel&apos;s 2 restaurants, or stay in and take advantage of 24-hour room service. Quench your thirst with your favorite drink at a bar/lounge.Business, Other Amenities Featured amenities include limo/town car service, dry cleaning/laundry services, and a 24-hour front desk. Planning an event in Newport? This hotel has 16500 square feet (1533 square meters) of space consisting of conference space and meeting rooms.